Why Should I Do This ...? Everyone starts with a curiousity, about the continent, about the history, about the animals ... about the people. Some visitors come to Africa to find their roots, to trace their lineage ... some to experience the visceral beauty of this vast, unspoiled land ... some to learn first-hand that indeed lions snore and gorillas burp! Many people come because they're curious about the people of Africa, about a society that is not too many generations removed from their tribal ancestors ... many because they have a hunger for knowledge about a land that's so very different, yet whose people share the most basic of human values and aspirations. 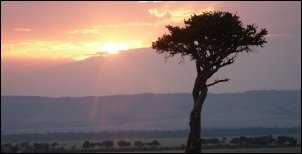 The beauty of the land, the animals, and the people of Africa are waiting for you ... but be forewarned: they will steal a small corner of your heart, and the memories of your visit will live there forever.